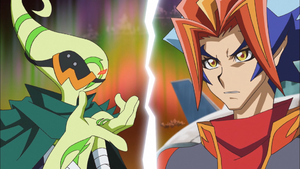 "Windy the Revenger" is the eighty-eighth episode of the Yu-Gi-Oh! VRAINS anime. It first aired in Japan on February 6, 2019. Before settling his score with Varis, the revived Windy attacks Soulburner in order to carry out Lightning's plan. With Windy's hatred for humans being now even greater than before, can Soulburner withstand his relentless assault?! The Duel is conducted as a Master Duel. As there are no cards on the field, Windy activates the effect of "Stormrider Griffore" in his hand, looking at Soulburner's hand, and if he has a Spell/Trap(s) in his hand, Windy Sets one of them to Soulburner's field, then Windy Special Summons it. Soulburner's hand contains "Salamangreat Mole", "Salamangreat Fowl", "Salamangreat Claw", "Salamangreat Beat Bison" and "Salamangreat Roar", then Windy Sets "Roar" to Soulburner's field and Special Summons "Griffore" (1200/800). As Soulburner controls a card in his Spell & Trap Zone, Windy activates the effect of "Stormrider Hippogriff" in his hand, Special Summoning it (800/1200). Windy sets "Griffore" and "Hippogriff" in the Link Arrows to Link Summon "Stormridership Rockbuster" (2000/↑↓) to the Extra Monster Zone. As Windy used "Hippogriff" as material for a Link Summon while Soulburner controls exactly one card in his Spell & Trap Zone, Windy activates its effect, sending Soulburner's Set card to the GY, then Soulburner draws a card. Soulburner's Set "Roar" is sent to the GY, and he draws a card. As Windy controls no cards in his Spell & Trap Zones and Main Monster Zones, he activates the effect of "Stormrider Skyfisher", Special Summoning it from his hand (?? ?/0) in Defense Position, then Soulburner Sets a Spell/Trap from his GY to his field, but it cannot be activated. Soulburner Sets "Roar" from his GY. Windy sets "Skyfisher" and the Link-2 "Rockbuster" in the Link Arrows to Link Summon "Stormridership Bahamut Bomber" (2800/↙↓↘) to the Extra Monster Zone. As "Bahamut Bomber" was Special Summoned while Windy controls no cards in his Spell & Trap Zone, he activates its effect, targeting a card Soulburner controls and destroying it, then inflicting 500 damage to him. He targets and destroys Soulburner's Set "Roar" (Soulburner: 4000 → 3500 LP). Soulburner Normal Summons "Salamangreat Falco" (1200/1600). Soulburner sets "Falco" in the Link Arrow to Link Summon "Salamangreat Balelynx" (500/↓) to the Extra Monster Zone. As "Balelynx" was Link Summoned, Soulburner activates its effect, adding "Salamangreat Sanctuary" from his Deck to his hand. As Soulburner Link Summoned a Link Monster this turn, he activates the effect of "Salamangreat Mole" in his hand, Special Summoning it to his zone a Link Monster points to. He Special Summons it (0/0) to the zone the bottom-center Link Arrow of "Balelynx" points to. Soulburner sets "Mole" and "Balelynx" in the Link Arrows to Link Summon "Salamangreat Sunlight Wolf" (1800/↑↓) to the Extra Monster Zone. As a different "Salamangreat" monster was Normal or Special Summoned to Soulburner's field, he activates the effect of "Salamangreat Fowl", Special Summoning it. He Special Summons it (1800/200) to the zone the bottom-center Link Arrow of "Sunlight Wolf" points to. As a monster was Normal or Special Summoned to a zone "Sunlight Wolf" points to, Soulburner activates its effect, adding a "Salamangreat" monster from his GY to his hand. He adds "Falco". Soulburner sets "Fowl" and the Link-2 "Sunlight Wolf" in the Link Arrows to Link Summon "Salamangreat Heatleo" (2300/↙↑↘). Soulburner activates the Field Spell "Salamangreat Sanctuary". As Soulburner activated a Field Spell Card or its effect, Windy activates the effect of "Stormrider Gargoyle" from his hand, sending it to the GY to activate the Field Spell "Stormrider Turbulence" directly from his Deck or GY. He activates it from his Deck. The effect of "Turbulence" increases the ATK of all "Stormrider" monsters on the field by 300 ("Bahamut Bomber": 2800 → 3100 ATK). As Soulburner has three or more "Salamangreat" monsters in his GY, he activates the effect of "Salamangreat Beat Bison" in his hand, Special Summoning it in Defense Position (2800/1000). Soulburner activates the effect of "Beat Bison", targeting FIRE Link Monsters in his GY up to the number of face-up cards Windy controls and returning them to the Extra Deck, then Soulburner can negate the effects of face-up cards Windy controls up to the number of cards returned until the end of this turn. He returns "Sunlight Wolf" and negates the effects of "Turbulence" ("Bahamut Bomber": 3100 → 2800 ATK). If Soulburner Link Summons a "Salamangreat" Link Monster, the effect of "Sanctuary" allows him to use a "Salamangreat" Link Monster he controls with its same name as the entire material. Soulburner sets "Heatleo" in the Link Arrows to Reincarnation Link Summon "Heatleo" (2300/↙↑↘) to the Extra Monster Zone. As Windy controls a "Stormrider" Field Spell in his Field Zone, he activates the effect of "Gargoyle" in his GY, banishing it to send a "Stormrider" Field Spell he controls to the GY, then take a "Stormrider" Field Spell from his Deck with a different name, and either activate it or add it to his hand. He sends "Turbulence" to the GY, takes the Field Spell "Stormrider Blast" from his Deck, and activates it. The effects of "Blast" increase the ATK of all "Stormrider" monsters on the field by 400 ("Bahamut Bomber": 2800 → 3200 ATK) and by a further 300 for each "Stormrider" Field Spell in Windy's GY. Windy has one Field Spell in his GY ("Turbulence") ("Bahamut Bomber": 3200 → 3500 ATK). As Windy controls exactly one "Stormrider" Link Monster, the effect of "Blast" negates the effects of Link Monsters Soulburner controls with an equal or lower Link Rating. Windy controls the Link-3 "Bahamut Bomber", so the effects of the Link-3 "Heatleo" are negated. As Windy controls a "Stormrider" Link Monster in the Extra Monster Zone, the effect of "Blast" forces Soulburner's monsters to attack it, if able. "Heatleo" attacks "Bahamut Bomber". As a "Salamangreat" card Soulburner controls would be destroyed by battle or card effect, the effect of "Balelynx" allows him to banish "Balelynx" from his GY instead. The attack continues and "Heatleo" is not destroyed (Soulburner: 3500 → 2300 ATK). As Windy controls no cards in his Spell & Trap Zones and Main Monster Zones, he activates the effect of "Skyfisher", Special Summoning it from his hand (?? ?/0) in Defense Position, then Soulburner Sets a Spell/Trap from his GY to his field, but it cannot be activated. Soulburner Sets "Roar" from his GY. Windy activates the effect of "Bahamut Bomber", targeting a card in Soulburner's Spell & Trap Zone and destroying it, then inflicting 500 damage to him. He targets and destroys Soulburner's Set "Roar" (Soulburner: 2300 → 1800 LP). Windy sets "Skyfisher" in the Link Arrow to Link Summon "Stormridership Stratastorm" (1500 → 1900 → 2200/↓) to the zone the bottom-left Link Arrow of "Bahamut Bomber" points to. "Bahamut Bomber" attacks and destroys "Heatleo" (Soulburner: 1800 → 600 LP). "Stratastorm" attacks and destroys "Beat Bison". Windy activates the effect of "Stratastorm", banishing it until his next Standby Phase.